The countdown to Dreamforce is on and Cloud for Good is excited to see you there! We love coming together with so many like-minded people from all over the country to celebrate the power of Salesforce. 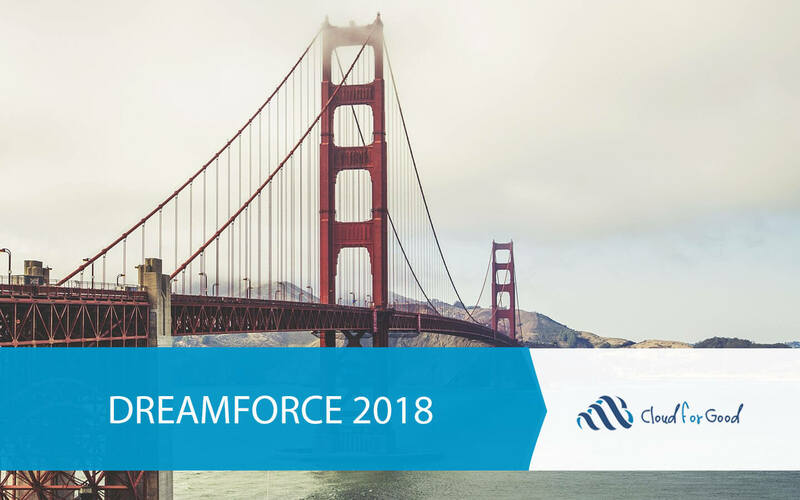 Growing every year, Dreamforce 2018 has more opportunities to learn from the Salesforce Ohana than ever before. Whether you are a Salesforce newbie or an experienced guru, you will not only gain powerful knowledge at Dreamforce, but you will also meet many influencers and several Salesforce lovers like yourself! At 12:00 PM at the Westin St. Francis – California West, Cloud for Good’s Senior Cloud Consultant, Julie Workman alongside Will Newlin of YMCA and Andrew Parker of Family Search will discuss how to make your emails stand out in their session, The Relevant Ride: Taking your Constituents on an Email Journey that Makes Sense. Also, at 12:00 PM at the Westin St. Francis – Cascade Theater, join Cloud for Good’s Director of Sales, Tara Guastella as she discusses Elite Fundraising Strategies for Any K-12 Private School with Mike Halloran from Catholic Schools Center of Excellence and Samantha Charnes from Interlochen Center for the Arts. Interested in seeing what makes Lightning so cool? Join Cloud for Good’s Cloud Consultant, Daniel Gorton and other Lightning champions for a Demo Jam at 3:00 PM in the Hilton Union Square – Grand Ballroom A. Lightning implementation got you down? Join the conversation as Cloud for Good’s Cloud Consultant, Roger Miller and trailblazers Caitlin Simon of Partnership for a Healthier America and Nina Asay and Arturo Guillen of The Arc San Francisco share how they leverage a user-centric approach to Lighting for their key business processes. You can find us at the Westin St. Francis – Tower Salon A at 8:00 AM. Join Cloud for Good’s Account Executive, Eric McCune and Mike Grandel of the National Aquarium at 11:30 AM in the Westin St. Francis – Adventurer’s Auditorium as they share how becoming a connected nonprofit has impacted their organization. You’ll also get some sneak peeks into Cloud for Good’s third-annual State of Salesforce in the Nonprofit and Education Sectors Report. See how Salesforce can help bring together your CRM and Marketing Engagement data seamlessly with Cloud for Good’s Senior Cloud Consultant, Julie Workman and Cloud Consultant, Courtney Philips alongside Robbie Rusbuldt of Concern Worldwide and Paul Holman-Kursky of Common Sense Media at their Single Source of Truth session at 12:00 PM in the Westin St. Francis – Tower Salon A. At 2:30 PM in the Westin St. Francis – California West, learn how these trailblazers, Marti Tedesco of Peninsula Open Space Trust and Hristo Banov of AFS Intercultural Programs and Cloud for Good’s Cloud Consultant, Courtney Phillips, use Pardot and it’s CRM-integration to communicate in a personalized way with hundreds to thousands of constituents. Need a killer communication strategy for your Lightning transition? Come hear Cloud for Good’s Cloud Consultant Support Specialist, Daniel Gorton discuss how to Plan for Success with Lighting at 4:30 pm in the Moscone West – Admin Theater. Learn how to turn data into actionable takeaways with Einstein Analytics at 10:00 AM in the Westin St. Francis – California West, with Cloud for Good’s Vice President of Services, Dana Genson, Lola McCall from Reading Partners and Dana James from Community Clinic Association of Los Angeles County at their session, The Secret Sauce to Success: Outcome & Impact Reporting on Salesforce. Interested in what else we’ve got going on? Check out our Dreamforce landing page. You can also visit us at the Career Fair, join us at one of our sessions or fill out the form below to schedule a time around your busy Dreamforce schedule. We can’t wait to see you in San Francisco!